– Food is the Perfect Medicine. The seasons are shifting …the days are becoming shorter and the temperatures are becoming colder. You can really feel the transitions of the seasons and it is a time when we become a little more vulnerable. Food is the perfect medicine. In Ayurveda Food is the number one focus in healing. We know that food builds, fuels and repairs every cell in the body, and by means of the subtler energies it also fuels and heals our emotions. What you eat is as important to your mental health, as it is to your physical health. Ayurveda recognizes that we are all so different and that “one shoe does not fit all.” All foods are classified according to taste; Virya i.e. heating or cooling effect; the dominant quality (guna) of the food eg drying, oily etc. The principle of strength of digestion and the amount of toxins on the body, are always taking into consideration. A good example of right diet wrong person, would to treat a Vata dominant person with all raw food and juices for long periods of time. This would eventually increase the Vata through the cold, astringent, and drying action of the food. Raw is Ok for detox, but generally for Vata people, they require more warm and unctuous foods. To treat a person’s health without careful regard to diet is like tending a garden without checking the soil and amount of sunshine and water it receives. . Good food leads to good health and mental well-being. In addition to this he will be allocating the next day – Thursday 11th May Vijay will be offering – one on one consultations. These will be held here at Ayurveda Health in Milford. 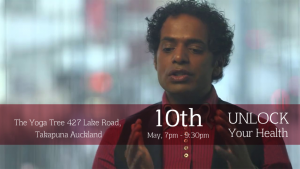 There are a few spaces left in the afternoon If you wish to book please email me perry@ayurvedahealth.co.nz. It will be a case of “First in first served”. We are offering a “restorative class moving in to meditation” again starting for 6 weeks in May. A very nourishing form of Yoga that benefits all people (there is no need to have had any prior yoga experience). Note this recipe serves about 6 people. We have made this recipe in our cooking classes and I am feeling like eating this warm and nourishing food again. Very yummy and perfect for the coming colder months. The recipe calls for green lentils. Split or red lentils will likely get too mushy here. I used 4 cups broth because I like my soups on the stewy side, if you prefer more broth to you soup, add another cup or two when cooking the lentils. Add the rinsed lentils, broth, thyme and turmeric , cumin and coriander powders to a large pot. Bring to a boil, turn down to a simmer and cook for about 20 minutes. While the lentils cook, heat the coconut oil in a pan. Add the onion and sauté until just browned. Add the lemongrass, salt, cardamom, cinnamon, pinch of red pepper flakes and some fresh ground nutmeg and sauté another minute. Add the onion mixture to the lentils and stir, keeping the heat on a low simmer. Add the coconut milk and greens and simmer another five minutes, stirring occasionally until just wilted. Taste for salt and spice and add, as you prefer. Finish with the citrus juice and serve warm with toasted coconut flakes and cilantro on top. Intuition, intention, awareness, acceptance are cornerstones in creating lasting change. On and off the Yoga mat, these principles enable us to let go of old patterns and ways of being. • Our habits become who we are.